Here at Pro-Fab we work with clients of all sizes on projects large and small but one thing that never changes is our commitment to outstanding customer service, our attention to detail and our exceptional quality products and workmanship, at affordable prices. 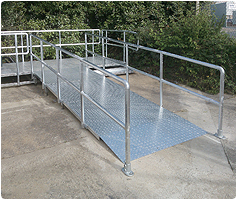 We work hand-in-hand with our clients helping them to comply with legislation by designing and building portable or static access ramps perfectly crafted to suit the space available. Here at Pro-Fab we specialise in the design, production and installation of high-end, innovative commercial kitchens and bars, offering a wide range of high quality kitchen extraction options. 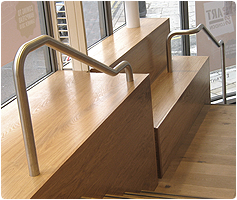 We pride ourselves on offering an extensive range of custom-built stainless steel hand rails, from utilitarian railings to beautifully crafted feature rails to perfectly showcase any staircase. Pro-Fab offers a comprehensive range of services and products in mild steel aluminium and stainless steel. Our team of highly skilled fabricators offer extensive experience in general sheet metal work and welded fabrications, and we work hand-in-hand with our clients to deliver high quality products at competitive prices, combined with a friendly and efficient service. 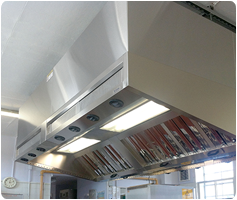 Here at Pro-Fab, we work on projects of all sizes, from mild steel stainless steel and aluminium repairs, to the design and execution of small- and large-scale metal fabrication works, such as commercial stainless steel and aluminium kitchens, bespoke equipment and shop fittings. Based in the centre of Norwich, we work with companies across Norfolk, Suffolk and East Anglia, as well as throughout the UK. Pro-Fab was founded in 1989 in an industrial unit on the Sweetbriar Industrial Estate in Norwich, Norfolk, which is where they have been ever since. The company was founded by Chris Rush and Gary Smith, who have worked together since 1977, when they both started their apprenticeships at the same sheet metal company at the tender age of 17! Both now married, with 4 children and 1 grandchild between them, they still enjoy working together over 35 years later. As well as Chris and Gary, Pro-Fab now employs 3 metal fabricators in the workshop and between them they boast over 200 years’ combined experience in the sheet metal trade. They are joined by Sue and Debbie, who do bookkeeping for the company and not forgetting Charlie, Gary’s 3 year-old Cocker Spaniel who joins them in the office every day. As the company approaches 25 years in business, Chris and Gary are still successfully delivering sheet metal work and welded fabrications to their ever-expanding list of clients, many of whom have been with them since the beginning, and they both look forward to another quarter century in the business! Pro-Fab offers a tailor-made service for each of our clients, ensuring that we perfectly match their mild steel, aluminium and stainless steel requirements. We will work hand-in-hand with you to deliver bespoke support to perfectly meet your needs; from one-off repair work to the design, delivery and installation of complex mild steel, aluminium or stainless steel fabrications, and everything in between. Here at Pro-Fab we also offer a comprehensive catalogue of sheet metal work services, including brake presses, CAD, CNC machines, guillotining, metal cutting, metal folding, precision sheet metalwork, sheet metal design, sheet metal machining and laser profiling. In addition, we pride ourselves on our professional and extensive range of enhanced services which include measuring up, design, fitting & installation, experienced advice, maintenance and delivery. different types of work. " "Extremely pleased. Thank you for your hard work and we look forward to a continued happy working relationship. "